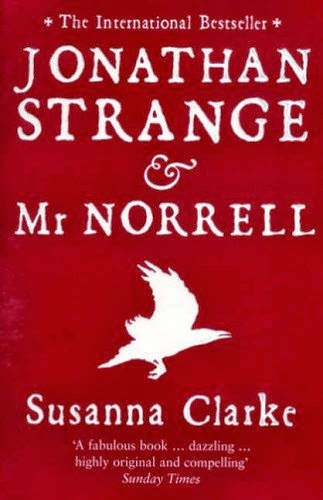 I just finished a book called Jonathan Strange & Mr Norrell, by Susanna Clarke. It was such an extraordinary book that I felt an urge to review it even before I finished it, and I think (I hope) my writing will be able to take some lessons from it. The book had sat on my bookshelf for over a year, after I bought it for £3 at a second-hand bookshop on the Charing Cross Road. I delayed reading it because it is a big book, at just over 1,000 pages, and I knew it would swallow enough reading time to fit in two or three smaller books. I also noticed that, judging by the fold marks on the spine, its previous owner had got a couple of hundred pages in and given up. I think I can see why, now. The book sets out telling the story of Gilbert Norrell, a small, dull, dried-up sort of man with little eyes that he blinks rapidly when annoyed, but who, nevertheless, is the last practicing magician in England. Clarke devotes the first 250 or so pages almost exclusively to Norrell, and consequently the story is rather lacklustre and about as unlikeable as Norrell himself. From its slow start however, the book gains incredible momentum, as Clarke adds layer upon layer of peril and dramatic irony, most of it deriving from the deliciously horrible gentleman with the thistledown hair. The arrival of Jonathan Strange shortly after saves the book. Daring, young and brilliant, he is exactly the character the reader is desperately hoping for, and indeed Clarke seems as grateful as the reader is for the chance to abandon Norrell and journey with Strange to the war with Napoleon and into realms of death and madness and fairies. The magic is one of the things that really sets the book apart. Clarke’s imagination makes the spells of Harry Potter look mundane and childish, as her magicians conjure ships made from drops of rain, move mountains and villages, raise the dead, and walk on lonely paths between worlds. Probably the most striking thing about the book though is its enormous patience. Everything is told unhurriedly, with Clarke going to great lengths to show the reader the depth of the world she has created – almost Tolkienesque in the detail of its fictional history – along with every facet of every character. Sometimes she seems to trust rather too little in the intelligence of her reader, often straying into stating the bleeding obvious, but I suppose it is better than leaving the reader adrift 700 words in without a clue what is going on. This is what I want to take from Clarke’s writing and hopefully integrate into my own – not the stating the bleeding obvious part, which I already do too much of, but the taking my time to create the depth of the world. My novel is also set in an alternative imagining of England, and I feel that so far I have done a poor job of showing my reader what it looks and feels like. I shan’t take as long with this as Clarke does; I am hoping to finish on about 300 pages, not 1,000. But I do think I spend too much time rushing from one event to the next, not leaving enough time to stop and enjoy the scenery in between. I will try to take more time in future.